Back Cover: "Dani Justice knows all about monsters. They haunt her dreams--and her life. But she never expected to find herself on the trail of a real flesh and blood predator so cunning, he's eluded the best law enforcement could send against him; so deadly, he doesn't hesitate to kill even a senator's daughter. Or a cop. Dani doesn't want to hunt this killer. But she doesn't have a choice. She alone commands a weapon powerful enough to stop him. And she knows something even Bishop of the FBI's Special Crimes Unit doesn't know. Dani knows how the hunt ends. It ends in fire. And Blood. And death. What she doesn't know is who will survive." I picked this book up as part of the Take A Chance Challenge hosted by Jenners. 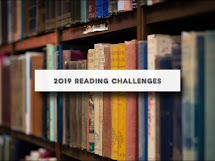 #1 of the challenge is random book selection in which you choose a section in the library or in my bookstore, following predetermined directions such as 3rd shelf over, 4 shelf down, 10 book over and see what book you find. My random book find was "Blood Dreams" and a very good find indeed. 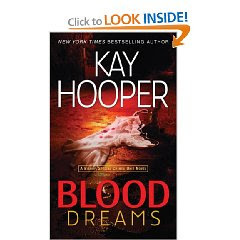 I've read a couple books by Kay Hooper in the past and liked them, so couldn't go wrong. Blood Dreams is the first in a new Bishops Special Crimes Unit trilogy with the 2nd book Blood Sins already out in hard bound and the paperback to be released at the end of December. Dani can predict the future through her dreams and lately she's been dreaming the same scene every night - a warehouse on fire and they are searching for the killer and someone he has trapped. As the story progress, the dream alters slightly and Dani isn't quite sure what it means. She and her sister Paris share a twin connection and Dani's abilities are stronger when they are together. They are part of the psychic team that makes up Haven, a special crimes unit that operates without interference from the government or the police. The story follows the perspective of several characters including the killer's who kidnaps, tortures and kills women. Other members of Haven are introduced as well and their stories will be told in the remaining books of the trilogy. "Regarding the story, I have to admit that “Blood Dreams” surprised me a bit. You see, based on what little I had read about the novel, I thought it was going to be a standard suspense thriller—serial killer on the loose, a manhunt, some police procedural thrown into the mix and so on. What I didn’t expect was the Special Crimes Unit to be a team of psychics! I know that psychic abilities in police work is nothing new to literature, film or television, but I just wasn’t expecting it with this particular book, so I was caught off guard, but in a good way :)"
"The best part of the story is the suspense. The serial killer was super creepy (and for readers who have a low tolerance for violence, this book is not for them). Dani was so convinced something terrible was going to happen and that sense of foreboding was well conveyed to the reader. Dani’s dream vision is told more than once and I never found it to be repetitive which is something I feared. The ending was a surprise and didn’t cheat Dani’s visions."